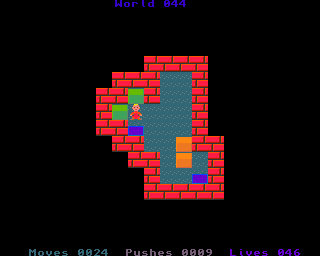 World fourty-four is small and easy to solve. It is good for relax after the previous hard puzzles. Go RIGHT, DOWN, DOWN and push RIGHT. Push UP, go RIGHT, UP, push LEFT, LEFT and LEFT. Go RIGHT, RIGHT, RIGHT, UP, UP and LEFT. Push DOWN, go RIGHT, DOWN, push LEFT, LEFT, go DOWN, LEFT and push UP. Go RIGHT, RIGHT, DOWN, DOWN, DOWN, DOWN, RIGHT, RIGHT and UP. Push LEFT, go DOWN, LEFT, push UP, UP, go LEFT, UP, UP, RIGHT, RIGHT and DOWN. Push LEFT, LEFT, go RIGHT, RIGHT, push DOWN, DOWN, go LEFT, DOWN and push RIGHT. Congratulations. You have completed world fourty-four. Get ready for world fourty-five.